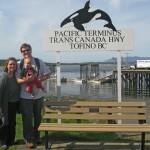 Joe Kurmaskie and his wife Beth set out on a cross-Canada adventure with their three boys, ages 9, 7 and 1. Method of transport: bicycles. Really. And it was awesome. 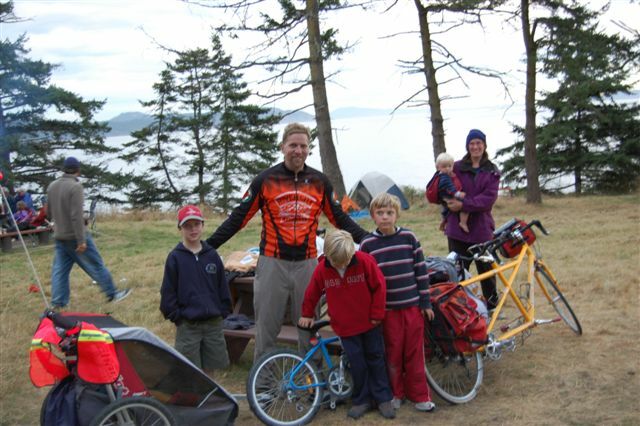 Kurmaskie’s crew started out from their home in Portland, Oregon, cycled to North BC’s Prince Rupert, then east across Canada to Halifax, Nova Scotia. 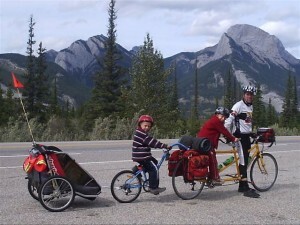 They started out on a three-seat tandem bicycle, pulling a trail-a-bike with a baby trailer attached. 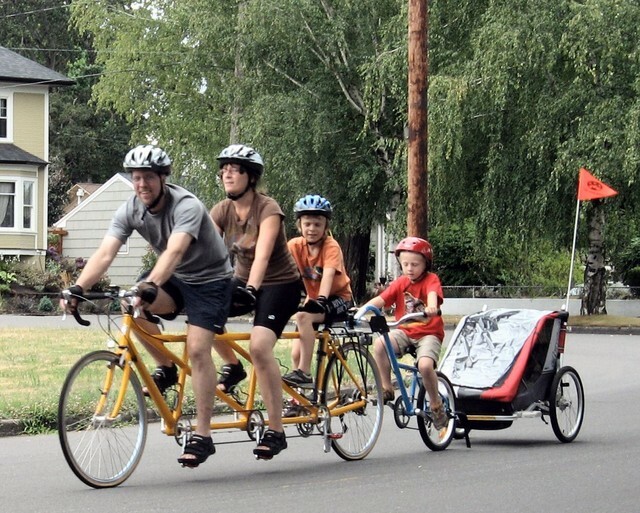 But always conscious of safety, the couple soon switched to a two-seat tandem for Joe and one son, pulling a trail-a-bike and baby trailer, with Beth riding alongside on her own bike. Q: What was the best part of your journey? Having the whole family join a wheeled adventure, all of us, for the first time. Beth had never joined one of these long trips before, nor had my youngest son. So this was a high risk, high reward deal — road testing a perfectly good marriage if you will. And it broke my way. Beth turned into Xena Warrior Cyclist and I couldn’t have been more proud. Q: What was surprisingly challenging? and diapers and fishing poles. It was the equivalent of a rolling Bowflex on wheels. But once I got the rhythm of it … man, just talking about it now makes me miss those days of labor. The pay off — the amazing places and things and people we saw and met, and the quality time spent with my sons in the saddle talking about stuff you don’t get to in the workaday existence. Q: Which part of the Pacific Northwest did you enjoy cycling most? That’s like asking me which part of paradise was exceptionally sparkly… but here goes. 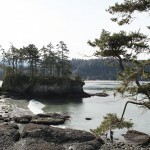 The Olympic Peninsula. You feel like you are pedaling through Lake Country in Switzerland. Q: Which part of BC did you enjoy cycling most? Why? and all it has to offer, even if you went up to pedal it every summer for the next dozen years. 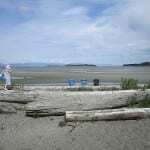 Which is what we intend to do — spend at least a week every summer exploring some spot on that island. That said, the Yellowhead Highway from Prince Rupert to Smithers in Northern British Columbia is like something from the Land That Time Forgot – like you’ve pedaled right into a landscape from Lord of The Rings. 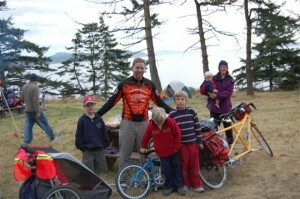 Q: How would you recommend a family start out with a cycling vacation? What are the “baby steps” to a bike vacation? Everyone must decide what their comfort zone is – a weekend trip out to the regional state park or even starting with a few day rides that put them in their bed that night. But soon you want to push it just a bit beyond what you think is your comfort zone. I recommend that no matter what time frame and length you chose you get everyone comfortable on the bike rig. I choose to keep the family – at least all the kids, attached to me – that way I don’t have to worry about everyone’s judgment when it comes to traffic and routes and safety. I stay hyper aware and alert about traffic issues, but don’t have to burden a nine-year old or even an eleven-year-old with that responsibility. This formula has worked for two continents and 10,000 miles of family bike travel. So they get to pedal and ride and get exercise but they don’t helm their own bikes. Q: What kind of bike set up will you use on your next trip? As my family is growing up we are planning to shift over to two tandems and one of us pulling a trailer and one pulling the trail-a-bike. Why does that seem to add two more people than my family? We aren’t Catholic, just careless. We just welcomed our fourth son, Sawyer Ray Kurmaskie, into the world. He’ll be the one in the trailer this time. Matteo will graduate to the trail-a-bike and Enzo to the other stoker seat on the second tandem. Of course I might end up pulling both the trailer and the trail-a-bike again – you’ll have to ask my wife before we set out on the next adventure. 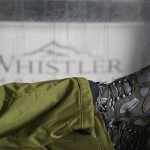 Q: Did one community in the BC or the NW really stand out for you? 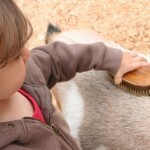 vote for Salt Spring Island, BC, for the combination of people, experiences, food, moments of tenderness and acts of kindness given and received. Q: What did you do when the kids got whiny or tired? How did you inspire them to keep going? The gang had digital cameras and plastic lightsabers and lots of new experiences every moment. Because a bicycle adventure is active and keeps them involved and lets them stop for things they spot or want to do or check out the kids NEVER once asked if we were there yet. Because we always were. Curious? Want to hear more about how this all went down? I sure do. And now my husband wants to follow Joe’s trail (the compromise for mom — cycling between spas, ha). Buy Joe’s book at discount AND support Joe’s project “Camp Creative,” when you order “Mud, Sweat and Gears” at Metal Cowboy. Mention that you read this article and he’ll take 20% off the price. Check out Joe’s website for more info on Camp Creative or his other endeavors. I would also encourage you to check out his funny and fascinating slideshow of the adventure. 1. How did they plan their itinerary – using bike maps? 2. What was on their packing list? 3. How was their gear distributed and carried on the bikes? 4. When is the book about their adventures coming out? The book is already out, I’ll bet you’ll find answers in the book! HARA – all that and more revealed in my books – you can order autographed copies at metalcowboy.com and proceeds go to my foundation to run Camp Creative – email metalcowboy@metalcowboy.com and we’ll give you a 20 percent discount. You’re gonna love my books – you wouldn’t want me performing brain surgery on ya, but this I have down cold.